My husband and I constantly strive to be a good example for our son, in all aspects of life. We correct each other when we forget to say 'please' or 'thank you,' my husband always opens the door for me, and we never leave without saying 'I love you.' I truly believe that kids pick up on these things very early on! Studies even show that children are more likely to adopt healthy habits if they see their parents following a healthy lifestyle. This summer, my husband and I will be sure to set a good example for my son and protect ourselves from the sun. It will be routine in our house that we don't step foot in the sun unless we have on sunscreen. With skin cancer cases on the rise, it's not worth the risk! In fact, skin cancer continues to be a health epidemic. Melanoma rates in my state of Michigan are on the rise and have increased 35% in the past 10 years. Let's try to help stop this upward trend and use sunscreen! Both my facial lotion and body cream have sunscreen in them, but when I'm out in the sun, I'm sure to layer on at least an SPF 35 or more. 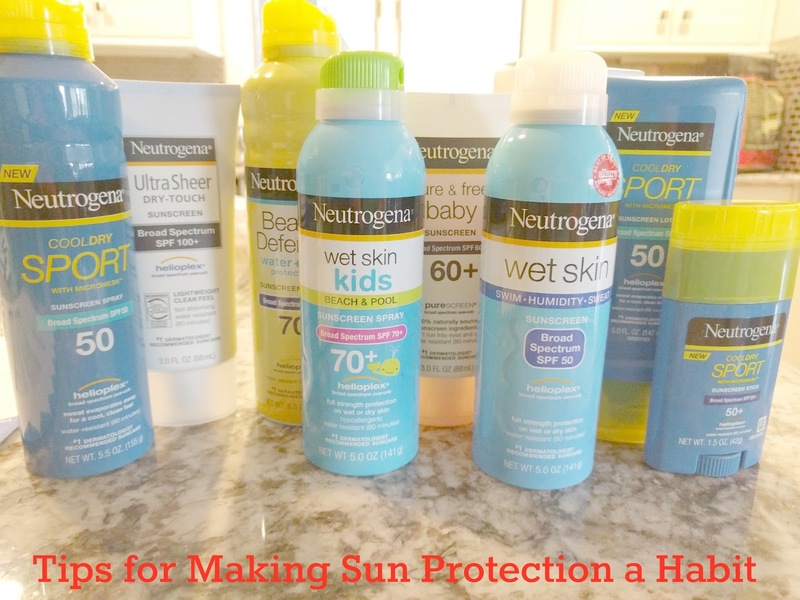 Neutrogena has a full line of SPF products, from Sport to Beach Defense to Age Shield, they have you covered for every aspect of life in the sun, all the way up to 110 SPF. They also have a full line for kids, so you can help make sunscreen application a habit, early on. Make it fun! Have your kids put it on the mirror so they can watch the sunscreen go from white to clear as they rub it in. Make it a contest! Who can apply their sunscreen the fastest? But of course, make sure it's applied evenly! Make it a game! Monkey see, monkey do. Have the kids mimic you putting it on, or turn it into a game of "Simon Says...put sunscreen on your nose!" What healthy habits have you started to instill in your children? Show us by getting your kids to 'mimic mommy' applying sunscreen. Make sure to tag #ChooseSkinHealth and @Neutrogena! Sun protection is a must for our family. We have had three relative fight skin cancer. Two of them were no small fight. It can be way worse than a lot of people think. Thanks for the great reminder! We had to go out and buy new sunscreen before the parade and working outside yesterday. This is so important. I've had at least a dozen places that looks suspicious. I can't recommend this enough. 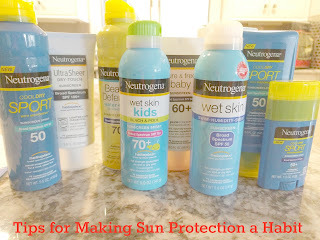 I love Neutrogena products too! An amazing brand that provides great skin care solutions. Growing up, sun protection wasn't a big deal for us. Most of us foolishly thought we didn't need it since we weren't Caucasian. So glad I know better now.